CWA President Chris Shelton and New York Governor Andrew Cuomo slammed Verizon Communications for the Verizon Wireless layoffs the company announced. Cuomo's office said the closing of two call centers in New York as part of a nationwide consolidation plan is "an egregious example of corporate abuse – among the worst we have witnessed." Shelton said Verizon was exhibiting "corporate greed at its worst" by closing call centers and laying off 3,200 retail store workers. He pledged that CWA will keep up the fight against "very greedy" Verizon and will continue to work with Verizon Wireless workers for the union voice they want and so clearly need. In addition to the store layoffs, Verizon is closing seven call centers affecting thousands of workers in Henrietta and Orangeburg, NY; Bangor, Maine; Lincoln, Nebraska; Wallingford and Meriden, Conn., and Rancho Cordova, Calif. Negotiations continue for a contract covering 3,900 workers, members of IUE-CWA Local 83761, at Appliance Park in Louisville, Ky. In June, China-based Qingdao Haier Co. finalized the purchase of the GE Appliances operation. Concurrent negotiations are being held at the main Appliance Park table, with IUE-CWA National and Local bargainers, and the Appliance Service bargaining table, with coordinated bargaining by IUE-CWA, the IBEW, Machinists, UAW, and United Electrical Workers. Any Pennsylvania voters wondering whether Senator Pat Toomey's (R-PA) newfound opposition to the Trans-Pacific Partnership (TPP) trade deal was a deeply held belief or an empty attempt to help his re-election campaign got a pretty straight answer from Toomey himself recently. In an interview with the Philadelphia Inquirer editorial board, Sen. Toomey admitted that while he currently opposes TPP, he is "open to reconsidering" the TPP at some point in the future. The news, given Sen. Toomey's vote in support of fast tracking the TPP and past vocal support for the TPP, isn’t surprising. "This is more evidence that Pat Toomey's anti-TPP stance is all about political cover, not authentic opposition to this bad trade deal," said Ed Mooney, CWA Vice President, District 2-13. "Unless and until Senator Toomey can confirm that he plans to vote against the TPP in a lame duck and in any other future legislative session, we will put his anti-TPP stance in the category of political posturing where it belongs." Iowa activists made a strong showing at an anti-TPP rally in Davenport sponsored by the Iowa Citizens for Community Improvement. They were joined by Our Revolution Board Chair and former CWA President Larry Cohen and Steve Abbott, president of CWA’s Iowa State Council. Abbott noted that the TPP agreement is 5,500 pages long, and said the public wasn't informed about it for five years. "I am scared to death about the TPP," he said. Our Revolution is the group launched in the wake of the Bernie Sanders campaign with the goal of turning the presidential campaign into a long-term progressive movement that focuses on issues like opposing the TPP, making college affordable, providing healthcare for all, and raising the minimum wage to $15. Learn more and get involved here. Read more about the Iowa rally here. If anyone needed more evidence that Donald Trump is unfit to be President of the United States, the events of the past several days and last night's debate more than supplied it. Trump's demeaning view of women has no place in our nation, nor does his attack on Latinos, disabled persons, veterans, or any of the other Americans he has insulted and treated with disrespect. Hillary Clinton reminded us: "China is illegally dumping steel in the United States and Donald is buying it to build his buildings. That is something I fought against as a senator and I would have a trade prosecutor to make sure we don't get taken advantage of by China, on steel or anything else." We've all heard Donald Trump say he "wants to make America great again" but we know that he buys his steel from Chinese manufacturers and hides those purchases so no one sees just how anti-American-worker he really is. Hillary Clinton reminded us: Donald Trump's tax plan "will give the wealthy and corporations the biggest tax cuts they've ever had, more than the Bush tax cuts by at least a factor of two…The way that he talks about his tax cuts would end up raising taxes on millions of middle-class families." And she promised: "People like Donald Trump, who paid zero in taxes, zero for our vets, zero for our military, zero for health and education – that is wrong. We're going to make sure that nobody – no corporation and no individual – can get away without paying his fair share to support our country." Watching the second presidential debate also made clear that Hillary Clinton listens to ordinary Americans. She hears their concerns and works in a serious way to address the issues that working families care about. That's what she has done throughout her years of public service, especially on behalf of children, in her tenure as a U.S. Senator and her service in the Obama administration. We've heard far too many empty words, doubletalk, and insults from Donald Trump during this campaign. Working families deserve better and that's why, with just one month to go until Election Day, members of my union are doing everything they can to elect Hillary Clinton the first female president of the United States. CWA has thousands of members and retirees in all the battleground states who are engaged in this election. CWA Women for Political Power, a separate program, is up and running in 20 states. Arizona members phone banked for Adrian Fontes, the Democratic candidate for Maricopa County Recorder; and Paul Penzone, a former Phoenix police sergeant who is challenging Maricopa County Sheriff Joe Arpaio. 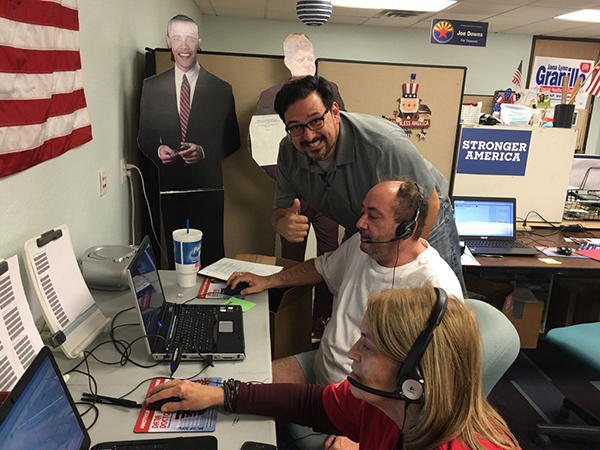 Adrian Fontes visited a CWA phone bank. 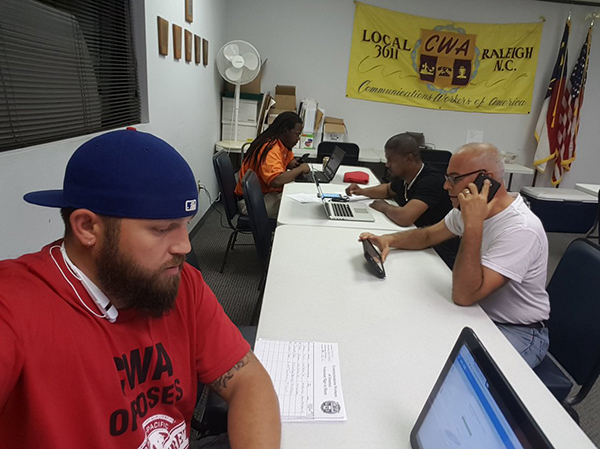 CWA Local 1120 members worked the phones to help elect Zephyr Teachout, who is running to represent New York's 19th Congressional District; and Terry Gipson, a former state senator battling to retake his seat. North Carolina CWAers worked the phones for Democratic Senate candidate Deborah Ross, who is challenging Republican Richard Burr; and Democrat Roy Cooper, who is running for governor against Republican Pat McCrory. 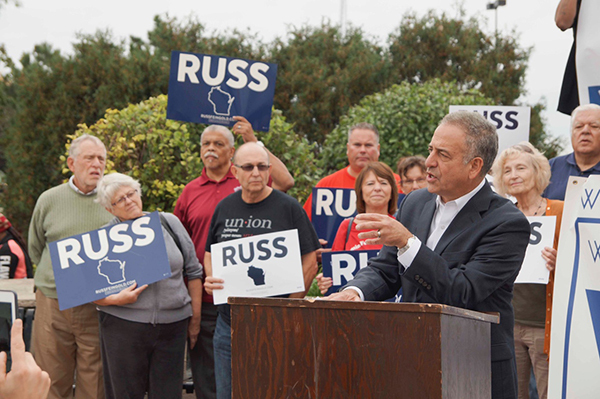 CWA District 4 Staff Rep. Clinton Rodgers rallied with Russ Feingold, the former Senate Democrat fighting to reclaim his old seat in Wisconsin, at a Working Families Party Event. A new Russ Feingold commercial features former CWA Local 4603 Vice President Mary Jo Avery. Her appearance is about 10 seconds into the commercial, which you can watch here.